It was meant to be in southern Lancashire, though it's a bit of a strange story. What do you mean, a strange story? Well, it's one of those little motorways that is actually a bit of a mystery, with various gaps in the "fossil record". 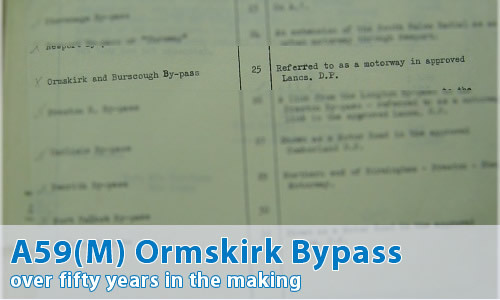 Well, the Ormskirk and Burscough Bypass appears in the 1949 Road Plan for Lancashire as passing to the west of the small towns of Ormskirk, Burscough and Rufford, all on the A59 Liverpool - Preston road. According to the Road Plan, it would have started at the junction of the A59 and B5195 to the south of Ormskirk, round to a point just to the north of the A581 north of Rufford. It is, quite clearly, described as an all-purpose (or non-motorway) route. It next turns up in the Lancashire County Development Plan of 1951, where once again it is described as being an all-purpose route. Or to be more precise, the word "motorway" does not appear in connection with the route. Back to Lancashire Archives, and the "fossil record" shows up the Lancashire Roads: Situation Report 1960, where the Bypass shows up once again. This time, Lancashire County Council decide that yes, it is indeed a motorway plan. Finally, the route description becomes a little more obvious, whilst a small extension to the north appears to have been added to the 1951 route. The By-Pass commences at the northern end of the dual carriageways of the Aughton By-Pass on A59 and lies generally to the west of the existing road. It crosses the Southport - St. Helens Trunk Road A570 where a two-level system is provided. There will also with two-level connections with the A59 at Sollom to serve traffic between the Chorley area (via A581) and Liverpool, and near the northern terminal at Bank Hall with permits free flow without cross traffic at the junction with the existing road, giving access between Southport (via Trunk Road A565) and Preston. However, the Situation Report goes on to explain that the Admiralty had intimated that they had an intention to close Burscough Airfield, which lay near to the proposed route of the A59(M). This meant that the Ministry of Transport requested that Lancashire County Council looked again at the routing, with the possibility that the motorway should go across the airfield, saving just over a mile of the journey. It was reported to cost in the region of £4,500,000.